Sonicwall Comprehensive Gateway security suite (CGSS) provides you with a single integrated package of security technologies designed to stop known threats.Secure your network at the gateway against threats such as intrusions, viruses, spyware, worms, Trojans, adware, keyloggers, malicious mobile code (MMC), and other dangerous applications for total protection in a convenient, affordable subscription-based service. • This is for the new/renewal license only. 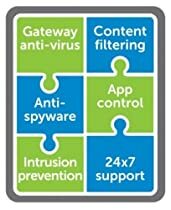 Comprehensive Gateway Security Suite includes - Gateway Anti-Virus, Anti-Spyware, Intrusion Prevention and Application Firewall Service, as well as Content Filtering Premium Services, and 24x7 Support with Firmware Updates. SerenIT is a subsidiary of Virtual Graffiti Inc. We are an authorized reseller for Sonicwall products. Please call us with questions on hardware or services. All prices are negotiable.